← The Many Faces of Gunma-chan — Train Conductor! This entry was posted in School Life and tagged adorable, cute, fruit, Japanese, JET, Jet Program, nashi, pear, school life, student, sweet. Bookmark the permalink. That’s great. Other than a few minor things, I think the English is wonderfully legible and understandable (especially if one understands Japanese, too). Plus the refrigerator art is great. Right? 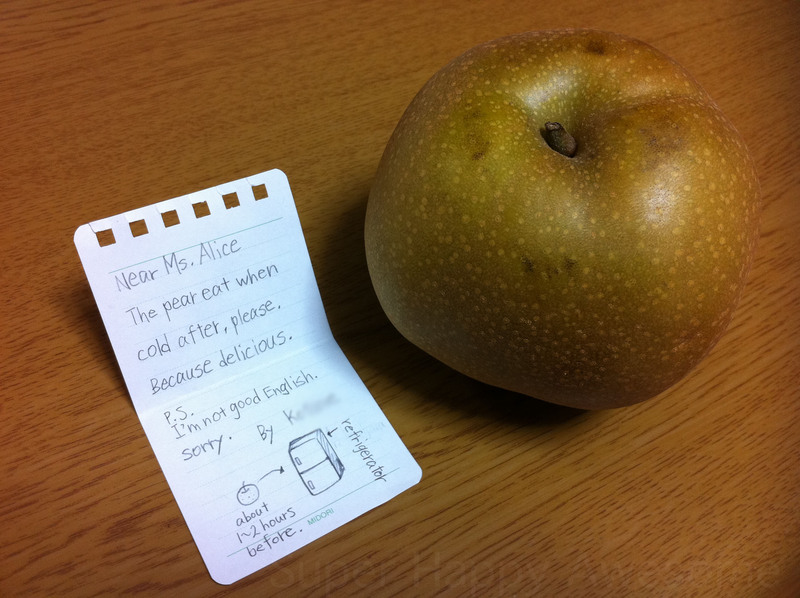 The instructions were delivered after the pear, perhaps she was worried she forgot to tell me. Adorable! KAWAII!! Another reason why I want to teach English in Japan… the children are adorable!! Ohhhhhh my goodness. That is just the cutest!